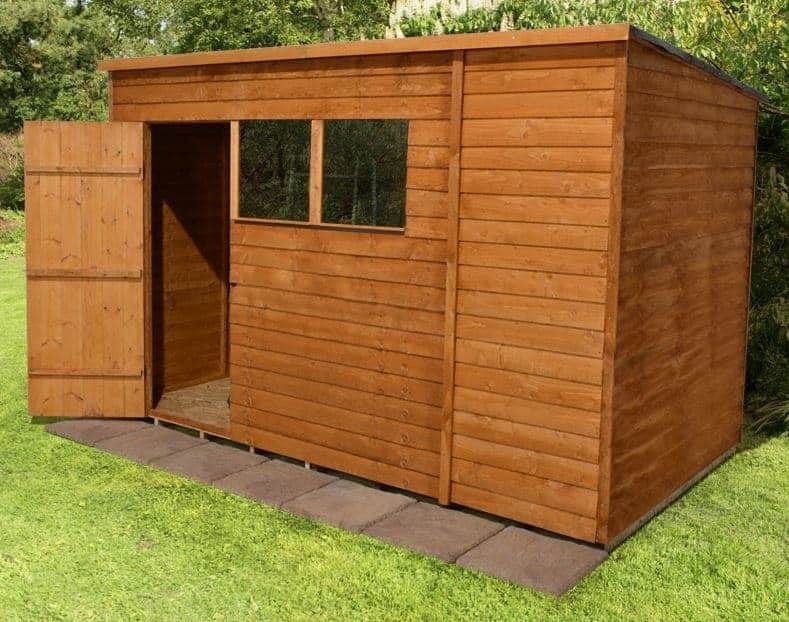 This large Shed-Plus classic overlap storage shed comes at a fantastically low price. Designed for those on a budget, this is a great choice for all of your large gardening accessories. With an extraordinarily large interior, the shed is practical, convenient and comfortable to use. Shed Store have pre-dipped the timber so that it is covered in a weatherproof barrier. The floor joists have also been pressure treated to ensure they really last. These are just two features which make this overlap shed stand out from the rest. As it is built with a pent design, the shed has a large width and a small depth. So it will largely suit those with a very wide garden. The single door is offset to the left hand side of the building and there are two styrene windows located next to it. A hasp and staple is fitted onto the door, but you will need to buy a padlock to keep it locked. The sloping pent roof is extremely effective at directing rainfall away from the building. The mineral felt covering also ensures further waterproof benefits, along with protection from falling debris in harsh winds. With adequate treatments, the shed does provide a great 10 year anti-rot guarantee. As it is constructed with overlap cladding, it has a rough-sawn appearance that some customers may not like. Coloured treatments can be used to provide a more stylish finish however. 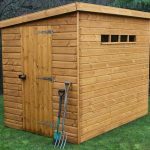 This classic overlap pent shed is part of the very popular Shed-Plus collection and it is created as a very basic storage shed. What we find extraordinary about this building is its height. With pent sheds, the height is different at the front than it is at the back. As the roof slopes downwards, the rear is shorter to allow it to be erected in front of fences or buildings. However, even the rear height of this shed is incredibly tall. The measurements are more in line with what you’d find with an apex shed. It’s a very wide building, though the depth is also pretty significant. 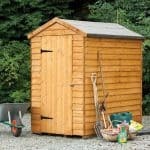 So whatever you plan on storing, as long as it is lightweight this shed will provide a perfect storage solution. OSB solid sheet materials are used to create the roof and the floor which is a pretty common construction with the Shed-Plus range. This type of material is basically used to ensure costs are kept to a minimum and they contribute to the low overall cost of the shed. The roof has a pent design which is a nice alternative to the more common apex style. It has a more modern appearance and still manages to protect the building from rot caused by a build-up of rainwater. Mineral felt is also provided to complete the water-resistant feature, though as you’d expect from the low cost of the shed, this also isn’t made from the highest quality materials. The floor is capable of holding light to mid-weight storage. If you’re in need of a heavyweight storage area then you could choose the assemble the shed without a floor. This can only be done however if building on top of a concrete base. Though designed with rough-sawn 8mm overlap cladding, this shed has been created with low maintenance in mind. Compared to some of the Shiplap sheds provided by the manufacturer, it requires no additional special treatment. Its low maintenance is credited to the free dip treatment given to the timber before it is shipped out. It provides a pretty strong surface barrier against all-weather types, though it still needs to be treated again once the shed is erected. 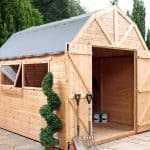 Overlap is the least expensive material to work with which is why this shed comes at such a low price. Standard framing measuring 28mm x 28mm created from European softwood forms the interior support of the building. If treated annually, the shed comes with a 10 year anti rot warranty. The door features an offset design, with two large fixed styrene windows placed next to it. The styrene measures 1.5mm thick which is pretty common and it is a safer alternative to glass. It is tougher to break, but if it is somehow broken, the glazing doesn’t shatter so there is a lesser risk of injury. The door isn’t braced so there’s a chance it could start to sag if it is used heavily on a daily basis. One benefit of this model that isn’t found on many cheaper sheds is the hasp and staple. It is more secure than a pad bolt and ensures maximum security if a padlock is attached. With no lock provided and two fairly large windows, it’s safe to say security and privacy aren’t on the top of the manufacturer’s list of priorities. However, it isn’t difficult to boost the overall security of the building. It already comes with a hasp and staple so all you really need is a padlock. The windows also only allow someone to peer into part of the building. This is a large shed and as the windows are located towards the side of the building, that leaves the other side completely blocked off from view. With good quality security your storage will be safe from thieves. With just two options available, the good news is you don’t have to spend a fortune upgrading the shed. The treatments are particularly worth buying. Like many other similar buildings, Shed Store provide a free tub of treatment with this model. However, if you choose one of the extra treatments you get to select from four different colours. This allows you to personalise the building, giving it a more professional looking and attractive finish. There’s a DIY Assembly Assistance Kit which may be worth buying too. Instructions, fittings and felt are supplied with the shed, but tools aren’t. This great kit comes with everything you could possibly need to put the shed together. The tools can also be used for other DIY tasks. 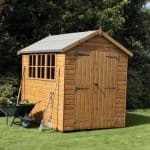 This is one of the more basic sheds available and the fact it is made out of overlap means it isn’t as high quality as similar tongue and groove sheds. However, saying that the quality is still reliable. As this shed is dip-treated at the factory, it offers slightly longer lasting durability than other overlap buildings. Whilst treatments still need to be maintained, the shed comes with a 10 year rot against fungus and rot. You can also lengthen the lifespan of the solid sheet floor by adding a thicker sheet of wood on top. This is a really wide shed and it offers an extraordinary amount of interior space. It’s one of the larger models on the market and will therefore suit most people’s storage needs. You just need to keep in mind that shelving can’t be added, though there are standalone storage units you can invest in which can solve this problem. As it is one of the bigger sheds available, installing it is going to prove more difficult than a smaller version. Unlike with other sheds, the manufacturer doesn’t give a guideline on how long it will roughly take to build. We’d suggest leaving at least 1 full day to put this together. 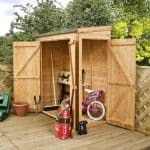 Though you are getting good value for money, some customers have argued you can find better quality sheds for the same cost. However, you need to take into account the benefits offered by the pent roof and the sheer level of interior space available. It is a good quality model for the price you pay and with regular treatments it should remain water tight. Final Thoughts: This is one of the most affordable 10x6 storage sheds and it comes with a few brilliant benefits. Though overlap isn’t the strongest cladding, this building has been dip treated to provide a tough waterproof finish. Regular annual treatments will ensure this shed lasts a minimum of 10 years. There is an awful lot of storage space provided, though it is a wide building so you need to make sure you have plenty of width available. The front facing styrene glazed windows supply a good amount of light, whilst one end of the shed remains completely private. Security is the only thing you will need to really upgrade on this shed. All in all it is a fantastic choice and for the price you pay you are getting great value for money.